To furnish your office space with high-quality refurbished office furniture in the Toronto, Ontario, area, turn to the experts at Reusable Office Interiors. We can provide you with top-of-the-line refurbished furniture from manufacturers like Haworth, Knoll, Steelcase, Teknion, and Herman Miller. This means that you can expect your new office furniture to be aesthetically pleasing and functional while still being economical. Office interior design – Our design professionals can help you create the perfect space for your office that your employees and clients will be impressed by. Delivery services – When you hire Reusable Office Interiors to handle the job for you, you’ll never have to worry about lugging around your bulky office furniture. Our team will handle all of the heavy lifting. Installations – Our skilled technicians will ensure that your new furniture is set up in a timely manner so that you can get back to work as soon as possible. Liquidation services – We will gladly liquidate your existing office furniture for you so you have one less thing to worry about. Project management – Updating your office can be a big job. Why not let our specialists handle the project for you? We will ensure the entire process goes off without a hitch. 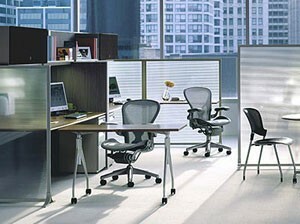 Whether you want to furnish one room in your office or update the furniture in your entire office building, we can help. We can provide you with desks and desk sets, office seating, executive furniture, conference room furniture, file cabinets, and so much more. If you would like to learn more about the refurbished office furniture we have for business owners in the Toronto, ON, area, contact Reusable Office Interiors today.